Looking for private in-home or in-studio Opera Voice lessons? Our Vance teachers are ready to get you started. Find your teacher today! Check out some of our most popular teachers near Vance, AL including Tuscaloosa and Northport. Having appeared in many productions, I am thrilled to help students learn proper technique and the singing traditions of the art form. I’ve been working with Carla for several years. Over that time, I’ve had the opportunity to explore several vocal styles - jazz, musical theater, classical - and have performed on stage and even won a competition. She’s patient with my desire to learn different ways of singing. She’s taught me how to control my voice so I can sing straight tone or float my high notes. I am always impressed by how well she can explain techniques to the average person so you can actually translate it into a really cool sound. I’ve been so impressed, my children now take lessons and are having success at community auditions. I highly recommend Carla for her ability to work with all ages, levels, and styles. Want to sing that aria or art song, but just can't get that note to sound like the pro? Do you have an audition or performance coming up for a competition, scholarship, school, etc? I specialize in helping you find your voice and gain access to parts of your voice you may not even know you have yet. Come here to learn how to make the difference between all of the different qualities your voice is capable of. Let me help you find and improve your voice! Do you enjoy listening to opera and always wondered how to do it? Do you sing opera, but have been struggling with range, agility, and stamina? I can help you! We will work through simple exercises to unlock your operatic potential! Voice Performance students such as myself were expected to be able to sing a wide variety of art songs, sacred music literature and arias in English, Italian, German and Latin among other languages. We performed in various venues such as the Kimmel Center and Carnegie Hall and took numerous classes in proper classical diction and performance. I am an active performer and have been teaching voice for 7 years. I tailor each lesson to the student's needs and create a supportive and nurturing environment, which gives the student the opportunity to try new things out and take risks. In addition, I teach a classical technique that can be incorporated in any style of music. In Opera Voice, I will teach a healthy technique and apply it to arias and opera roles. r role debut as Donna Anna in Mozart's Don Giovanni at the Centre for Opera Studies in Italy. During the 2015/16 season, Ms. Balter returned to the Hawaii Performing Arts Festival as Marcellina in Mozart’s Le Nozze di Figaro, where she also covered Countess Almaviva under the baton of Maestro James Richman. In addition, she appeared as La Chatte/L’Écureuil in Ravel’s L’Enfant et les Sortilèges. Previously, Ms. Balter joined the roster of Russian Opera Workshop, where she covered Zemfira in Rachmaninoff’s Aleko and the title role in an abridged version of Tchaikovsky’s Romeo and Juliet. Balter began the 2016 season as a guest artist in From Heidelberg to Hanover, where she performed Strauss’ Four Last Songs in addition to selections from Lohengrin, Der Freischütz, and Tannhäuser with Lyric Opera Baltimore Artistic Director, James Harp. Highlights of the 2014/15 season included Second Lady in Mozart’s Die Zauberflöte with the Hawaii Performing Arts Festival, Alice (cover) in Verdi’s Falstaff with Harrower Opera Workshop, and An Evening of Opera & Song with the McDonogh Guest Artist Series. Ms. Balter holds the position of Artistic Administrator at the Hawaii Performing Arts Festival having previously served as Director of Admissions. Jamie Balter maintains a private voice studio in Tuscaloosa, Alabama, previously having studios in Springfield, Illinois and Miami and Tallahassee, Florida. She has previously served as the head of the voice program at The Music Factory in Springfield, Illinois and served on the faculty at The Stubbs' Music Center in Tallahassee, Florida. This spring, Ms. Balter will be teaching a masterclass as part of a series at McDonogh School in Owings Mills, Maryland titled An Artist Works: Tools of the Trade where she will discuss vocal technique, the key elements to having a successful audition, and how to make a website and a résumé. Loved her!! My daughter is 5 years old very high spirited and she really knew how to keep her attention. Can't wait until her next lesson!! Happy mommy! Nice, professional, great energy! My daughter loved her from the minute they started her first class. She is very patient and makes the class really enjoyable. First lesson was great, can't wait to continue! I have been teaching singing for 14 years. I specialize in pairing healthy vocal technique with music that engages your personality to bring out your joy in a musically engaging performance. Singers are actors, too! I teach all genres of music, with a vast knowledge of singing in Italian, French, German, and Spanish, in addition to English. If you have an audition, I can help prepare you and your materials, with focus on healthy breathing and vocal production. I want my students to reach their musical potential and aspirations while having a wonderful time! Hello! I'm a singer and actor who performs everything from opera to musical theatre to jazz to straight theatre. I have performed as far away as Bruges, Belgium. As a teacher, I have taught privately and in the classroom for the past 14 years. I have taught for the Metropolitan Opera Guild Urban Voices as a Master Teaching Artist, for the Boston Symphony Orchestra's Days in the Arts program, for Watertown Children's Theatre, and for the North End Music and Performing Arts Center where her students have shared the stage with the Boston Landmarks Orchestra and the Boston One City Choir. As a performer, her favorite roles include Anita in "West Side Story", Jo March in "Little Women", and Carmen in "Carmen". Throughout my classes with Alexandra -- she was kind, insightful, and encouraging. Before my lessons I had no formal training in music, sight-reading, or piano performance. I took the lessons to prepare myself for higher music education at Salem State University, and after the lessons I was able to pass my audition and continue on with the necessary knowledge to grow. Her way of teaching is free of pretentiousness and apathy. She is really an excellent instructor. Beginning classical training, with operatic sing as this goal, is one of this most exciting adventures you can take! My own musical journey has taken me performing from DC to Europe and Asia, to Princeton and NYC, and now back to the DC area! Having completed a Master of Music in Vocal Performance and Voice Teaching at the Westminster Choir College. The technique I've learned has enabled me to healthfully sing with orchestras and with opera companies. I would love to help you achieve your operatic goals with a strong technical foundation. Together, we can create the perfect program for your needs. Whether your goal is to sing professionally, to just to learn how to sing your favorite opera arias, I am your gal! Thank you so much and I look forward to teaching you! *Note* I'm only able to travel to give in-home lessons when the lesson duration is 45 mins or more. Hi there! My name's Grace and I'm a voice teacher and a classically trained performer. I recently moved back to the DC area and am delighted to begin a voice studio! 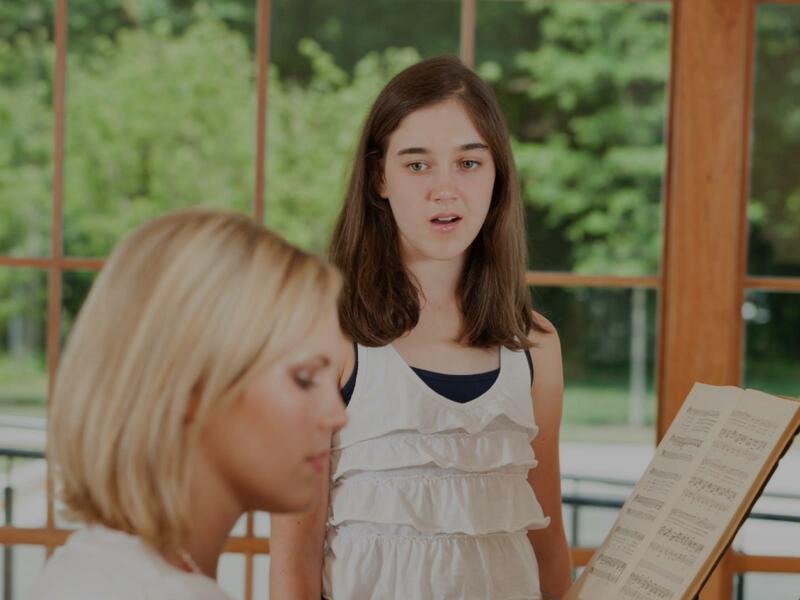 If you or your child loves to sing and would like to take your singing to the next level, feel confident as a soloist, or prepare for an audition, give yourself or your child a classical basis for how to healthfully sing. Now is the time! I have a varied background: I started out in musical theatre and choirs and now sing with orchestras, opera companies, and churches. I began teaching privately in college, then taught private lessons, before proceeding to the Westminster Choir College, where I just received a Master of Music in Voice and Voice Teaching (formally Vocal Performance and Pedagogy.) Hope to meet you soon! when the lesson duration is 45 mins or more. Grace is an amazing instructor. She has an expertise in singing and can guide your voice in the right direction, especially with her patient and positive way of teaching. She also personalizes the lessons very well and has you singing what you would like to sing and reach your goals! Grace G. is always well prepared for lessons with my 10 year daughter. My daughter is in special education at school and Grace relates very well with her and has helped her focus and stay interested during her lessons. I would recommend Grace for childrens singing lessons. Are you working on a solo piece for a musical? Or, wanting to train your voice to sing opera? What about just really rocking at Karaoke with your friends? My name is Kimberly, and I can help you do all of these and more! I am a classically trained singer with over 13 years of experience in the field. We can work on singing in a variety of styles, including: broadway, pop, classical, and opera. We will work on support, diction, vocalization, vowel formation, and we will work on your own unique sound. I look forward to meeting you! Hello! I’m Kimberly, and I am a huge music lover! I have been singing solos and with choirs for as long as I can remember! I went to school at Angelo State University, and I have had the opportunity to be classically trained.I've been working with singers since 2015 and have loved helping my students sing solos, in quartets, and in choirs. My teaching style is encouraging, fun, and student driven. First, we will see where you are as a singer. Then, together we will discuss your musical goals. We will work on making your voice stronger and your vocal range grow, so you can create your best sound! I took a couple lessons with Kimberly before I sang in a musical for my school. She helped me work on projecting and she worked with me on diction. It really helped! I have sung in many choirs, but there were some things I wanted to work on, including harmonizing, blending and vowel formation. Kimberly helped me so much with these, and I am so excited to sing for my church choir now! I would highly recommend her! With thirty-five years experience as a pro singer/stage director and vocal coach, I bring extensive international experience to my lessons. Having worked with singers at all levels of development, I will introduce you to vocal technique structured for where you are right now. I coach in multiple genres: Jazz -- determining keys, understanding charts and leadsheets, Broadway -- belt, mix and legit, Blues, and for classical singers, multiple languages. I work extensively with actors on both speaking and singing voice and with voice-over and media voices. As a stage director, I offer stage and performance etiquette, interpretation and how to prepare for auditions and recording sessions. If you are a community singer and just getting started, I love teaching the basics and will help you build the confidence you need! Lessons are in a double studio with high ceilings, great acoustics and both a grand piano and electronic. ommitted to offering my students what music can do for our world. I am Diane M. and a Google search of my name will connect you to tracks, videos and much more history about my varied and wonderful life in the Arts! NOTE: There are performance opportunities available through study in my private studio. Ask me about them! My daughter said she felt very comfortable with Mrs. Diane and she can't wait for her next lesson. It is a pleasure to provide a recommendation for Diane McNaron and her studio. My daughter has been taking private lessons for more than three years and we have been exceptionally pleased with the results. Ms. McNaron’s extensive background and experience in a wide variety of musical genres allows her to customize lessons around the student’s vocal strengths and interests rather than force a cookie cutter approach. Ms. McNaron has nurtured her talent in a positive, professional manner and I highly recommend her for those looking to improve, learn, or simply polish their current vocal skill set. You will not be disappointed. I have been taking lessons with Diane for four years now. She is an excellent instructor. I truly enjoy her lessons and the recitals at the end of the semesters. These lessons with Diane has given me confidence and I look forward to continuing them. Can't find a teacher in Vance, AL?